Spring may still feel a long way off, but across the country, for over a month, sanctioned tournaments and spirit games have been underway on campuses big and small. If you’re not familiar, secondary institutions are divided into two categories for competitive play: Division I for schools of more than 7,500 students and Division III for colleges of smaller sizes. With larger pools of players to choose from and potentially greater access to resources, Division I schools often dominate the college ultimate news with their high level of competition, exciting features on ESPN, outstanding star players, and Callahan Award winners. Without disregarding those aspects, it sometimes seems that this focus on Division I competition as the sole arena to watch, play, and learn high quality ultimate at the collegiate level can be very limiting. With each year Division III is growing in size and improving in competitiveness and can still provide engaging competition, train talented players and have intriguing stories. In fact, technically several teams from D-III size schools play up into D-I college competition every year, with teams like Carleton College consistently demonstrating their ability to keep up with the high paced competition of D-I. With that, here’s one more story showing why you shouldn’t count out the little guy. Meet Erynn Schroeder. She’s a Physics major, College of Saint Benedict senior, and a two-time rostered World’s player for Team USA in 2012 (U-19) and for the coming summer of 2015 (U-23). Erynn has a lot in common with her soon-to-be U23 teammates — she’s been playing for over seven years, has previous experience with international competition, and displays sick pulls and unstoppable layouts. However, unlike nearly everyone else selected for the USA team, Erynn competes with her college team Rapture (previously known as the Bad Habits) in the Division III league during the academic year. 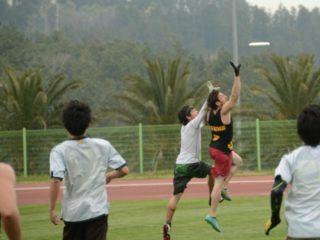 This presents Erynn with a unique perspective on college ultimate, international competitions, and balancing individual and team improvement within a developing division. Here’s part one of her story. From the outskirts of the Twin Cities, Erynn grew up playing ultimate with her family, high school, community, and finally as a summer practice player for Minneapolis club teams. While selecting a college, Erynn says that ultimate was on her mind — but that any school that had a team was an option. Although some schools are revered for their enormous, championship-winning ultimate teams that she might have played on: Erynn stands by her choice to attend a school that met all of her needs. Her advice for young players looking at colleges? She said to consider the experiences you want in terms of education, location, major, as well as extracurriculars like ultimate. “I would not have gone to a school that didn’t have a team, but I also knew that I would enjoy a smaller, liberal arts college experience,” Erynn said. Also, she recommends attending a practice with the team if you’re on campus for college visit. Erynn says that these opportunities gave her a better sense of the team dynamic and gave her a chance to ask players candid questions about their school. The College of St Benedict has had an ultimate program for at least the past 15 years. Their small budget has proved sufficient to fit their needs as a team, including adjustments to accommodate for their recent nationals appearances. As a smaller team pulling from a limited pool of potential ultimate converts, Erynn mentions that the team works to acknowledge the academic setting that the Rapture players are in. Her take as a captain at a D-III liberal arts school is that the team should encourage players to put academics first but to make time for practice whenever possible. This can sometimes result in low numbers and a constant need for recruitment– a difficulty facing many smaller ultimate programs. However, Erynn says that every year without fail, people are always interested and ready to join the team. After her freshman year at St. Ben’s, Erynn was selected as an alternate, and then was bumped up to the official roster for the 2012 U-19 Worlds Junior Ultimate Championships (WJUC) in Dublin, Ireland. It was her second try for the team, and she describes the WJUC tryouts and tournament with a sense of admiration, saying how inspirational it was to play with and befriend amazing athletes from across the country. In Dublin, Erynn played as a D-line handler. With the help of Kyle Weisbroad, she worked to adapt her defensive style and technique to best respond to any situation. Erynn counts this experience as a huge time of personal growth, on and off the field. “I was amazed every day that I was lucky enough to be on that team,” Erynn said. Going back to school after WJUC was a bit of a strange transition for Erynn. While she was excited for the upcoming season, Erynn says that she knew that playing with her college team back home would require a very different mindset. By adjusting her expectations, she was able to share a lot of valuable knowledge from her WJUC trip with her college team. As a sophomore, Erynn took on a leadership position on the team and helped lead them to their first ever trip to Division III Nationals in 2013, which they have since followed with a return trip in 2014. As a both a Division III and an internationally recognized player, Erynn admits that she does think there can be some times in D-III competition where games are played at a lower level of play–most noticeably in the fall preseason. However, she also cites that the small nature of D-III programs can allow for more time to be spend on individual players. “There’s a steep learning curve and giving new players time on the field is the quickest way that they will learn,” she said. On the other hand, Erynn describes the annual St. Ben’s v. Carleton face-off in the game-to-go to Regionals or Nationals as some of the most competitive match-ups she’s ever played in. For this year, Erynn and her co-captains are looking to develop more depth and stability on their roster. She admits that it can be easy to win games at the D-III level if you have a strong seven women — a strategy they have used in the past — but that depth is what will win championships. A captain again this year, Erynn plans to take a step back at tournaments and help more from the sidelines so that everyone on her team can have a chance to play in those higher pressure situations or guard the fastest girl. This setup will also give Erynn a chance to practice her teaching and coaching skills, a role for which she is already well prepared. The division in which a player and team competes in is by no means insignificant, but it also doesn’t have to be the standard of what level is competitive and what is not. Each year, several Division III schools opt to play up to the D-I competitive series and can often stay competitive with larger programs and top-tier teams. Erynn Schroeder exemplifies the talent, diversity, and opportunity that is present within Division III and has even been able to connect her love of ultimate with her academics. Her Physics Honors thesis? An exploration of the forces and constants that govern disc flight. Stay tuned next month for an inside look into Erynn’s experience at WUC U-23 tryouts, and what she’s looking forward to on the world stage in 2015.